Sure, agree with the analogy. However at this particular stage where two HI elements have been added to the program.I think for me it's important to be cautious, they must be monitored closely, both athletes and new elements. When you talking about splits, what are you referring to? Indeed proceeding with caution is always wise. As for the splits, I was referring to 10m splits for any of their 100m races or 100m time trials under your coaching for the past 14 months. In this way, you are able to precisely track the transfer of training in such a way that is more descriptive then their times to the finish line alone. With the knowledge of incremental splits you are able to see what's happening during each phase of the race and adjust preparation accordingly. 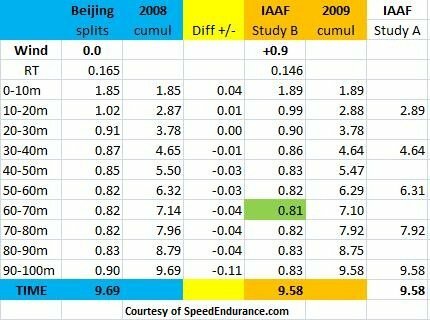 Having the knowledge of splits over 10m increments may have shown a conflicting proportionality trend in which, for example, early splits advanced (acceleration improved), however, later splits (max V, speed endurance) did not (even though for younger athletes it's usually the other way around). In this way, while the total times, alone, for the first three years present stagnation- there may very well have been linear improvements in one area of their race from year to year; however, training may also have posed a detriment to other areas of their race. As a result, again this is all hypothetical regarding your athletes, having the knowledge what is happening every 10meter segment is very useful. Unfortunately I don't have the whole 100m splits neither videos from competition where quality is good enough to measure 10m splits. What's interesting that they were almost on the opposite ends of the spectrum. One extremely fast and explosive out of blocks, burning way too much energy other not as explosive, looking like was building up momentum for much longer. From what I know they had some injuries, muscular and skeletal. Last edited by wermouth; 10-02-2015 at 12:48 PM. When we started to run, actually they moved better than I thought, decided not to increase the volume of the session. Circuit of hyper-extension, lats, Russian twists of 4x10 went smoothly, surprisingly enough there was good energy level by the end of the session. So there you go. Though it is going to be OK session with even option of doing bike workout and it turned out to be one of the better sessions of this GPP so far. Puzzled. Hurdles walkovers 180 in total. I have called this thread Experiment in progress for reason, I'll try to do intensive tempo (which I have never done it before) as of the next week for about three weeks and observe how guys are going to respond. I was thinking about 3x3x150 or 3x2x200, didn't make the decision yet. Keep in mind the placement of intensive tempo is critical with respect to the outcome of its inclusion in the load. Are you still having the athletes perform shorter hill distances on Monday and Friday and longer hill distances on Wednesday? Well, there are few options, one of them is to reduce volume on Friday and do intensive tempo on Saturday. Other option is to dedicate/ sacrifice key HI session, possibly Wednesday. The reason as to why I am planning to include intensive tempo is that I would like to have a one day a week in SPP where we are doing split runs over 60s but also longer runs in the same training unit. Just like John did with his 3x3x60+2x200. However I am leaning towards 2x3x60+2x150. Therefore I would like guys I coach to be prepared for this particular workout. Last edited by wermouth; 10-04-2015 at 06:56 AM.